Got the basics but want to some inside knowledge on gaining better skills? Hello David. Thank you for speaking with us today for the Winter 2016/17 Edition of FEKM-UK Magazine. We are all looking forward to training with you in London on the 18th February for the first FEKM-UK Mastercourse of 2017. This interview is to give our students a ‘sneak preview’ of David Fitoussi and the opportunity to learn something from your formidable 29-year Krav Maga expertise. Shall we start? What was that first clear moment in your mind when you realised that Krav Maga had connected with you for life? David: I would say it was at my first class with Richard Douieb. After having done a year of French Boxing and having tried several martial arts, it was THE thing I was searching for. Years later, in 1996, after being injured for many months and being far from Krav Maga, I couldn’t bear to do nothing. I gained too much weight and was getting out of breath. I also really missed being able to teach others and help people to defend themselves. David, would you mind sharing a story from your personal Krav Maga journey that had a profound, humbling or revealing impact on you? David: During life, there will be good and bad moments. Krav Maga has always be the solid rock in my life, in all of them. Our founding master, Imi Lichtenfeld, created Krav Maga and taught his students so that they “may walk in peace”. Would you share with us an experience where you have used Krav Maga to either diffuse or manage a potentially dangerous situation? David: The paradox is here; the more you train in Krav Maga the less you fight in the real life. And so you walk in peace. Even when I was a bodyguard, I never used Krav Maga directly. Only management of people and situations. One time, I did have to use Krav Maga when a group of three people wanted to steal my wallet. I had the opportunity to knock-out one of them and escape. But Krav Maga can also be very good for everyday situations. A perfect example is when in 2006, a car crossed my way while I was driving a scooter. My reflex was to avoid a direct front collision but I had no other choice than to fall on the road. Krav Maga rolls and falls are very useful in the that case! You have trained for many years directly with our FEKM director, Richard Douieb. Would you mind sharing with us what impact this has had on you? David: At first when I was very young (about 16 years old) and I was pretty impressed by Richard’s skills and cardio. At the beginning we were only a few students (about 10-15) and I had the feeling that I was practising something very useful and very efficient. It gives you confidence. It also shows you how to choose people you might follow… Or not! Richard was a very skilled person and a good representative for Krav Maga. So it also consolidated my free will for things other than Krav Maga. 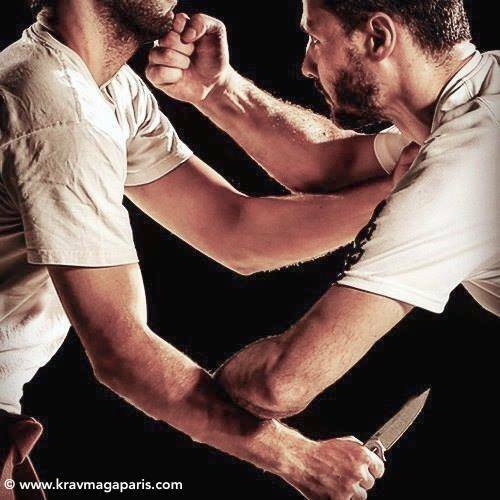 What key advice would you give newer FEKM students who are just starting out on their Krav maga path? David: Don’t chat during classes. Practice. Experiment. Keep the objectives in mind… more and more efficient, learn to defend, learn to fight… But overall, stay humble. Personally, I have found in Krav Maga a perfect way of life. Everything has to be simple, fast and efficient. In your experience, what is the most challenging aspect of Krav Maga that students must master as they develop and progress? David: Krav Maga has to be taken as a whole. When you achieve the road to your Black Belt 1st Darga, it opens new perspectives and a new understanding. But in fact, it takes about 10 years to control our discipline. So I think the challenge for us all is to challenge ourselves constantly to remain out of our comfort zone as we gain experience. We all have the 18th February FEKM-UK Masterclass in our diaries and a brand new gymnasium venue booked for the event. What are you most looking forward to in your London Mastercourse? David: I will be pleased to find motivated people who are thirsty to share knowledge. And finally, what can our FEKM-UK students and instructors most look forward to when training with you on the 18th February? David: Getting out of their comfort zone  It will be hard, but it will be good! Self-Defence Training – Is Krav Maga Right for Me? Does Krav Maga Training Really Make You Safer? The rhythmic and continuous flow of simple, direct and efficient attacking techniques to neutralize a threat characteristic in Krav Maga. Work on core stability first – the deep inner muscles close to the spine - then add core strength work.